Medical Nonwoven Disposables Market size was valued over USD 7.0 billion in 2016 and is expected to witness around 7.0% CAGR from 2017 to 2024. Growing elderly population will act as primary driver for medical nonwoven disposables market. Increasing number of people suffering from incontinence will fuel industry growth over the forecast years. Shifting trend towards sedentary lifestyle, unhealthy diet and excess alcohol consumption and tobacco smoking will increase the number of people suffering from chronic conditions such as diabetes, obesity, and chronic cough. These chronic conditions will lead to onset of incontinence due to stressed urinary sphincter. Growing incidents of hospital acquired infections will stimulate the global market growth over the forecast period. As per CDC report, over 720,000 incidences of hospital acquired infections in the U.S. were recorded in the year 2011. Growing prevalence of hospital acquired infections coupled with communicable diseases will accelerate demand for disposable nonwoven products over the coming years. The increasing number of incontinence cases will fuel industry growth. Nearly 5 million women in UK suffered from incontinency in the year 2016. Technological advancements including development of gender specific disposable incontinence underwear, biodegradable incontinence to prevent environment degradation is envisaged to positively impact the market growth during the forecast years. Reusable medical nonwoven products will act as restraining factor for market over the coming years. These products are cost-effective as compared to disposable nonwoven products as the can be washed and used for around 200 times. Technological advances in reusable nonwoven products such as antimicrobial fibre construction and enhanced comfort will further hinder the business acceleration. The ostomy liners and incontinence pads market is anticipated to witness significant growth over the forecast period due to increasing number of baby boomers and rising patient population suffering from incontinence disorder. 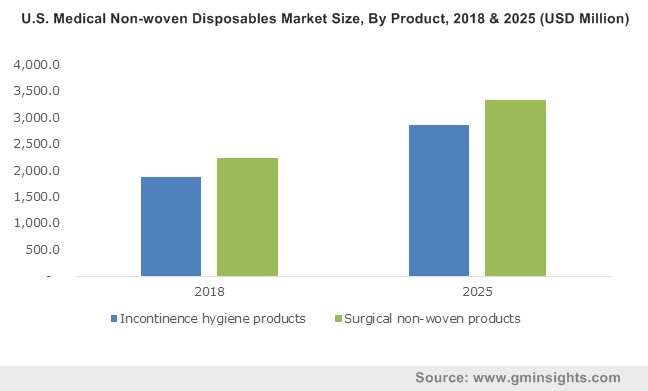 Favorable government initiatives to escalate adoption of medical nonwoven disposables will favour industry growth. The disposable nonwoven medical supplies market including disposable surgical gowns, caps, masks, drapes, and surgical sterile nonwoven swab is prophesied to grow considerably over the forecast period due to increasing number of surgeries and necessity of sterile environment maintenance during surgery. The prevention of micro-organism passage to avert occurrence of bacterial infection at surgical incision site holds utmost importance during surgical procedure. U.S. dominated medical nonwoven disposables market in 2016. The increasing elderly population along with rising number of incontinency patients will drive the market in U.S. According to data published in 2016 by the U.S. National Institutes of Health, around 15% of total U.S. women population suffer from overactive bladder and around 10% are on urge of suffering from urine incontinence. The rising incidences of hospital acquired infections and growing demand for high quality healthcare will favor business growth. Germany medical nonwoven disposables market will be driven by high technological adoption, increasing number of diabetic and obese patients leading to rise in incontinency incidences, growing adoption of tobacco smoking and availability of high disposable income. APAC market should witness significant growth over the forecast period owing to large geriatric population and high prevalence of hospital acquired infections. Improved economic status have led to rapid healthcare infrastructure development. Rising number of people suffering from chronic cough will stimulate medical nonwoven products regional demand. The well-established healthcare system coupled with rising adoption of unhealthy habits such as tobacco smoking will drive Middle East market. The growing awareness about incontinence and rising disposable income levels will fuel regional industry growth. 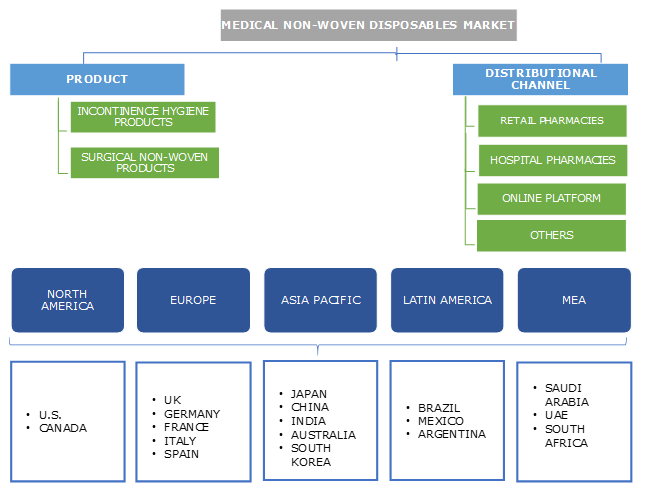 Some of the major players in global medical nonwoven disposables market are Covidien, First Quality Enterprises, Medline Industries, Ahlstrom Corporation, Kimberly-Clark Corporation strategically investing in R&D for developing advanced medical nonwoven products such as thinner adult pads with high absorbency to gain competitive edge. New product launches, partnership and collaborations are major strategies followed by industry players to consolidate their market position. Medical nonwoven disposables industry is envisaged to grow significantly during the forecast period owing to widespread use of nonwoven in medical field to prevent bacterial infection and cross contamination. Market players are continuously focused on developing new products delivering superior benefits and comfort. For instance, Kimberly-Clark Corporation uses breathable films laminates (aSFL) for fabric construction developed by thermally bonding microporous film with nonwoven layer to resemble natural cloth. The medical nonwovens currently present in the market comprises antibacterial fibres, implantable fabrics and nanofiber construction offering enhanced particle capture properties, resistance to abrasion and improved breathability.